iCloud Photo Library is still in beta but works reliably. It’s a much more convenient way to manage your photos you took with your iPhone or iPad. The only reason to not use it currently is the missing Photos app for macOS which is supposed to replace iPhoto and Aperture. It will be released in early 2015. 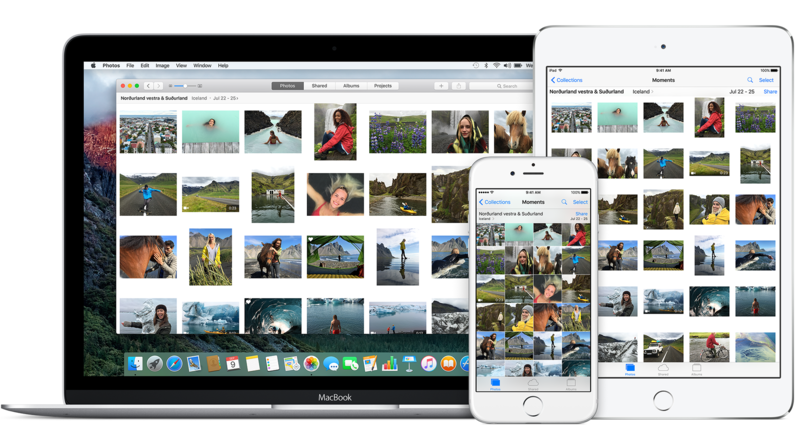 To get early access to the new Photos app, regular users can apply for Apple’s public beta program to get the current public beta of Yosemite 10.10.3 which includes the new Photos app. On iOS 8.0.2 and newer you can easily turn on iCloud Photo Library (Beta) in iOS Settings > iCloud > Photos. The main concept of the Photos app and iCloud Photo Library is to automatically have all photos on all devices. Changing, moving or deleting of a photo will be immediately mirrored on all devices. E.g. if a photo is edited on a Mac the photo will be automatically downloaded to an iPhone and replace the unedited version. The photos are sorted by time and location by default. This makes it much easier to find photos in a plethora of photos. It turned out that most people don’t manage their photos actively but just take a bunch and go back in time to find them. Albums are also supported but have to maintained manually like in iPhoto or Aperture. Photo library is also available in the browser on iCloud.com as Photos. You can upload, download or delete photos and add them to favorites (heart). Browser upload only allows uploading of images in JPG format. Other image formats or videos have to be uploaded using your iOS device. If the files you want to upload are not located on your iOS device you can use AirDrop to upload to your iOS device which eventually uploads your files to iCloud Photo Library. If Optimize iPhone Storage is selected in Photo & Camera settings, images taken with this device will be kept at high resolution. They will only be replaced with the lesser resolution version optimized for this display when the device runs low on storage space. So if you run low on storage you can keep more images on your iPhone or iPad. I totally love the simplified user interface which is the same on all devices: iPhone, iPad, Mac and browser (iCloud.com). It’s much easier to operate, much faster and Photos are synced automatically via the Internet to all devices without having those devices to connect to a Mac. I don’t miss iPhoto or Aperture at all. Simplicity rules.